10 Insights for New Networkers. About ten minutes into the reception, I heard an outburst of laughter. I turned and saw my son hugging a waitress. She was down on one knee, hugging him back with one hand, holding a serving tray with the other, and laughing. When I started on my own as a freelance writer and digital marketing consultant, I started networking. This is something most creatives I know are loath to do. And I know a lot of creatives. We typically have the same attitude toward talking to strangers that my wife and I had instilled in our son. Danger! But putting yourself out there is necessary for any entrepreneur. We’ve all read the advice articles which remind us that we are moving from a corporate culture to a relationship culture, and that it’s up to each of us to create and foster those relationships. But that information can sound like bad news to an introvert. So, those of you for whom ‘networking’ is a ten-letter curse word, I’ve compiled a simple series of steps to follow to make it easier for you to take action when you become aware of events you know you ought to attend, but don’t want to. And events are easy to find. Here in Kansas City, we have the Kauffman Foundation, a Mecca for small businesses, and sponsors like Think Bigger Business, One Thousand Cups, and any number of industry specific events, year-round. This one’s easy. Go online to these sites I just listed and get on their mailing lists. You’ll receive some interesting reads and an ongoing list of upcoming events. These events are almost always centered around featured speakers and topics, so look for those which are relevant to what you want to be doing, and sign up. If you’re an introvert to the nth degree, and feel the need for some support, invite a friend along. Pay for their ticket, and remind them of the promise of a nice catered meal, and maybe an interesting speaker or two. And before you go, finalize your “elevator pitch.” Think about how you can accurately and thoroughly explain what it is you do in about ten seconds or less. It can be as simple as, “Hi, I’m (your name). I’m a (graphic designer). Here is my card. Feel free to check out my website. (back to #3) What do you do?” That’s it. And don’t worry, you don’t have to sell. In fact, it’s better not to. Just introduce yourself. Let the conversation develop naturally, like any other conversation would. read nametags, even while they’re still sitting on the table at the entrance, to see which companies are showing up. Often, companies will send groups of employees to hear a particular speaker, and if the speaker is relevant to you, and relevant to them, those are some folks you want to meet. When the event is up and running, listen to other peoples’ conversations. 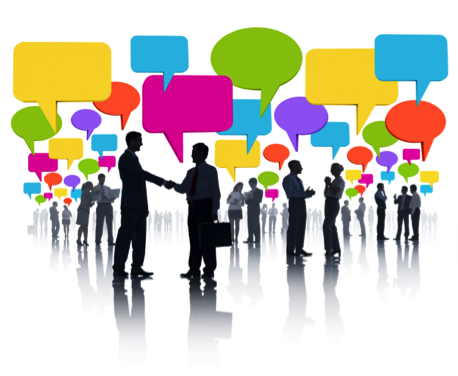 Notice how experienced networkers start talking to each other. And you don’t have to talk to everybody, but you should talk to somebody. Even if you just introduce yourself to the other folks at your table. You’re likely to run into someone like yourself, early in their career, not so comfortable standing in a crowd of strangers. You can find solace and comradery with these. If you’re lucky, you might find an old pro in your business who doesn’t mind paying it forward a little. And you cannot meet too many of these people. But don’t only talk to people who do what you do. You want to meet potential clients. But at the same time, don’t get your hopes up that you’re going to land a huge client or two, or think you’ve failed if you don’t. Keep your expectations in check. Just show up and meet some folks. Maybe give yourself a goal of handing out 3 to 5 business cards for your first few events. And realize your event experience is not finished until you have followed up within the next day or two with a short email to all the people who gave you a business card. A simple ‘it was nice to meet you, here’s a Linkedin connection request, let’s keep in touch.’ Quick and easy, but maybe the most important step. You’re building momentum toward crucial new relationships. And those potential mentors I mentioned in #7? Invite them for coffee. They can be your new best friends. Ask them which upcoming events they plan to attend, and go to those. It’ll be a comfort knowing you’ll have a friend there. Don’t overfill your coffee cup. You’ll find out soon enough that shaking hands is a messy business. And nothing kills a conversation with a nice person you just met like sending a drop of coffee arcing onto the sleeve of their crisp white shirt. Also, don’t be so happy about the awesome breakfast that you end up having to start a conversation with your mouth full. Even the tiniest little crumb flying from your mouth is a total credibility killer. Most of all, don’t put off getting the first event out of the way. Find one and go. It’s not as hard as you think, and they’re all easier after that. I’m sure you’ve figured out from my personal advice that other people (not me) enjoy a decent buffet, and there’s usually some pretty good food at these events. And the caterers are no doubt nice people. Just maybe don’t spend the bulk of your time talking to only them (unless it’s a catering seminar). And definitely do not hug the caterer. Unless she’s family.